This boy of ours is 11 years old today - happy birthday Aran! To celebrate, I've released a free pattern- 'Aran's Slouch' - and you can find it on the Free Patterns page. Usually members of The Woolly Hat Society get an exclusive period on free patterns yet this one's a little different, and I'd like folks to consider donating to their local kidney charity. 5 years ago Aran was living with chronic kidney disease having gone into renal failure a couple of months earlier on new year’s eve. Bronchial pneumonia hit boxing day 2013, which was preceded by impetigo. A post- strep complication led to acute PSGN (poststreptococcal glomerulonephritis) which was then further complicated by HSP (Henoch-Schonlein purpura). He was off school for months (the risk of infection was too great) and it would be at least another 18mths before he went into remission. Kidney disease can recur and stay for life (it's not something you're ever entirely clear of), with a possibility of end stage kidney disease, so he continues to have his annual checks. We are mighty chuffed that he continues to be in good health and clear of kidney disease for the last 3.5yrs. Acute PSGN and HSP mostly affect children and the year that Aran had acute PSGN 19,000 people died worldwide from the disease... we were the lucky ones. It's only really now that I can see just how hard this hit all of us. We were also facing eviction and we somehow all had to get through it and keep buoyant for Aran's sake. We got through it. Yet only a year after going into remission and winning the eviction case Brexit went & threw us back into uncertainty again... this week we should finally see some stability again. Go and enjoy this pattern on us, wish our boy a happy 11th birthday and keep everything crossed for a successful residency application? 2018 was a busy year, despite almost 4 months off with my two frozen shoulders. A lot of those patterns were already done and dusted before my left shoulder almost froze solid, and I’m mighty grateful to my past self for being that organised! 11 self published single patterns - Filigree Slouch, Ponderosa, Pebbles (which comes in Beanie and Slouch flavours), Laccio, Rhinebeck Hat, Lifted (MKAL), Juxta, Misura, Shuttered and Wrapped (which had never been available as a single pattern before). Filigree Beanie is missing from this collage as it had been previously published as a single, even though it was unavailable for a number of years. So I guess that’s technically 12 patterns? 7 free patterns were also published! I started publishing the free patterns exclusively via The Woolly Hat Society and I reckon that’s worked really well, I’ve certainly enjoyed it. I intend to pick it up again once the season starts dying down (late February time?) They’re all available on the Free Patterns page as downloads now, so head over there to find them. And of course, the Lateralis collection. This one is still kinda tangled for me, personally. Mostly because it’s a project that had been in the planning stages forever. I’d calculated the construction and maths a long time ago, years, but by the time I was ready to pick it up my shoulders were at their worst and I couldn’t knit. It ended up being released late which had quite the knock on effect on sales, marketing and general reception which added to the tangle. The last pattern published in 2018 is Trittico, which is in Carol feller’s Echoes of Heather and Stone book. A fun sideways design that allowed me to indulge my love of symbolism, and a design that was also done and dusted before shoulder issues fully kicked in. That all adds up to 25 patterns, which isn’t bad considering the year it was! I’ve lots planned for this coming year and 2019 already feels off to a better start than 2018. I’ve more time, I can knit and work without too much pain, and ideas are a plenty. 2018 is also the year that big big changes were made backend. Moving the business to Estonia was a huge moving that I just went ahead and did, and that hindsight tells me was bigger than i expected to be. I’ve learnt a lot, and I’ve started writing a lot of it down as so many people have asked me about it. It is without a doubt one of the best things I’ve ever done. The business is now safe out of the UK and away from Brexit; the business is healthier and I have wage slips. And I think the biz move is in part why this financial year won’t take a hit. I know from experience that whenever life gets in the way, turnover drops. For instance turnover went down 25% the year after Aran was critically ill and we faced eviction. It’s always the financial year after the life event that’s affected, and almost 4 months off with these shoulders earlier in the year would mean this season is when we’d be feeling it. An extra productive 2017 combined with the new accountancy system has helped keep us afloat. I’m not expecting to see much growth on last year but I’m not expecting to see a drop, either. Growth has been the norm for every year except the years where life has got in the way big style, so I’m happy to be keeping afloat. Who knows, the financial year or season isn’t over yet, but traditionally everything starts tailing off pretty quickly after January, so this is when I need to go for the last final push. We shall see. So that’s my round-up for 2018! Thank you for your continued support and let’s see if 2019 can be better than 2018? Can’t be hard, right? We’re on for the pre-release of Lateralis to be available from thursday and everything feels back on track! So many things feel more under control somehow this week, so I’m making the most of it. The cover and an accompanying PDF (explaining the schedule etc) will be available immediately, as will the first single pattern. Then the single patterns will be published once a week until the final collection as the eBook will be available. Everyone who buys the pre-release will receive an update notification via email each time a new single pattern is published, and you can use the link in the email to download the latest instalment. It’s been a while since I put an eBook on pre-release but I think most folk are familiar now with how the system works. Working this way allows me to start earning, which in turn means I can pay the team promptly. It means you can get your hands on the patterns as soon as they’re ready and start knitting them! And it gives me and the team vital extra time to add the polishing details to the eBook. Should be a win, win, yes? And so the first hat to be published will be Duality. It’s a very striking Hat with a very simple detail that’s highlighted by the construction. The stripes are created by short rows, allowing the fabric to remain balanced. As I say, the stripes themselves, beyond being short rows, are simple in and of themselves - it’s the construction and placement of the stripes that makes this Hat so striking. Because there are a lot less short rows to this Hat, and because the colourwork is easier to manage, Duality is a great introduction to the construction and an ideal first Hat to try. It also gives you a sense about how the yarns and colours work, which should help you make the right yarn choices going forward for the other Hats. Most of the Lateralis Hats have a preference to whether a variegated or semi-solid works as the main yarn, but with this one it doesn’t matter - you can swap them around and see what happens! The theme behind Lateralis is symmetry, reflection; factors or concepts of two. Unlike other sideways Hats, these consist of two sections, two halves, that are head-shaped and meet at the crown. This in turn means that the Hats can be worn in two distinct ways, and we’ve aimed to show that photographically. Not all of the Hats are worked as two halves - some are worked entirely as one piece, with the two sections becoming noticeably after turning through the crown, and some are worked as not quite halves to allow for special short row trickery at the crown, yet still result in a Hat of two equal pieces. I suspect the way the construction works may not be apparent until they’re knitted, and I promise they’ll surprise you in the best of ways. Talking of yarn, do bear in mind that these are graded by gauge - there’s virtually no room to adjust the pattern for different sizes. A couple of sizes are included in the pattern, but also in the pattern will be notes on exactly how many stitches and rows make up the Hat, so you can adjust the gauge for other sizes. This something we can definitely talk about more in my Ravelry group - we’ll set up a thread for each Hat. That’s me done here for today! Tomorrow I’ll introduce the 2nd Hat, Undulous. It's fair to say that I've too many projects on the go. All in various stages, they're sat there waiting for me to either get my brain in gear, or my body. One such project is the Absolute Range. I can't remember whether I've talked about it here or not, I know I've mentioned it to quite a few people in person. Anyhows, the point of the project was to create an alternative line of Woolly Wormhead Hats, one that was aimed at absolute beginners. I worked on quite a few Hats for this, and they sat there waiting for me to have the time to sit and write them in non-knitting pattern speak. 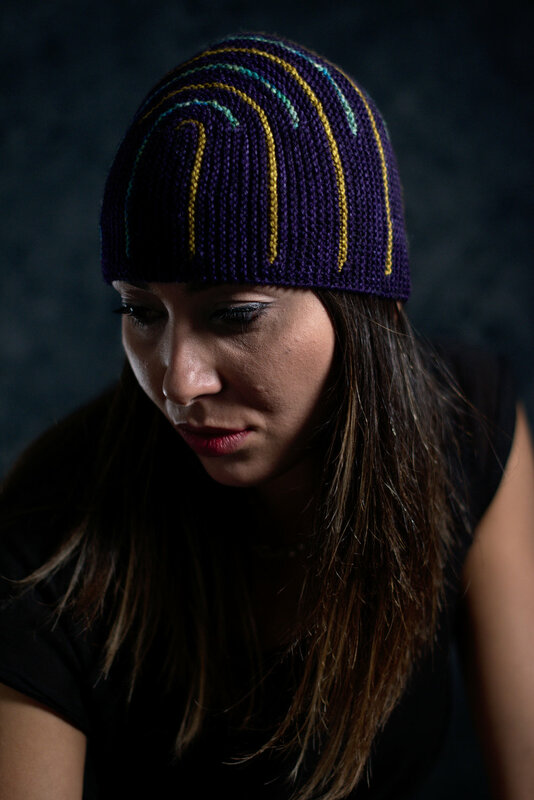 What I wanted to do was to write a pattern without the usual knitting pattern code, something that someone who knows nothing about knitting could pick up and make a Hat from. And I wanted to design things a little more interesting than scarfs - get clever with a bit of folding kinda thing. Now, writing a pattern that is suitable for non-knitters AND that would be suitable for teaching new knitters takes a whole other set of skills to writing a regular knitting pattern. If you ever fancy giving it a try, it's quite a useful exercise to undo your learning and think in terms of someone who knows nothing of which you speak. And it really does require a change in mindset. I know exactly how I want to write these patterns and what I want to say, but I haven't had the headspace to give them. And if I'm totally honest, they're not creatively fulfilling. The whole range would make good business sense, as the knitter that learns with you stays with you, but I've had to admit defeat on this one. Well, more that in my head I've moved on and I'm having loads more fun with more complex construction methods. So... as most of these are already written in standard pattern writing for basic Hats, I figured I might as well make use of the work I've already done and offer them as free patterns. Free patterns are still there to help beginners who've already got the gist of the pattern code, and they help me as I can reach folks who don't have much spare cash, and they also bring (lots!) of extra traffic to this website. It's win-win all round, really. New free patterns would usually go to The Woolly Hat Society first for an exclusive period but this one is so basic and pretty much the same as the IG Beanie only in downloadable form, so it's gone straight to the Free Patterns page. Enjoy! This last week I've knitted another new Hat; sent 4 new patterns to my test knitters and finished writing a handful of free patterns for the coming season. I've closed doors on some projects and frogged a bunch of patterns in progress and reskeined/washed the yarn. It feels SO good to tidy up this way. I'm not very good at having loose ends, they eat away at my brain and I'd sooner have that brain space to focus on the projects that I'm looking forward to, not back. And all this tidying up is helping to keep me busy, pottering, while I wait for my shoulders to be ready to dive into the thing that I've been working on for what feels like too long. The maths is all done, I just need to be able to knit at a decent rate! This week I'm slowly getting caught up with pattern writing, & going through everything that needs to be done so that I can focus on The Big Project. That also means organising my publishing schedule for the coming months! I'm going slowly, naturally, as some days it's still too painful to knit but I can manage a few hours at the PC. Having become quite detached from my work I'm appreciating the slow build up and the tidying of loose ends. This pattern is York Slouch, and will be the next free pattern exclusive to members of The Woolly Hat Society for a limited period before going live on the Free Patterns page. I designed it almost 4 years ago (!) but somehow hadn't got photos I was happy with. As much as it's a heavier weight yarn and maybe not ideal knitting for those of us heading into the warmer months, it's a great quick knit that is ideal for gifts or charity knitting or simply stocking up on woolly Hats before the cold season kicks in! After sending out my most recent newsletter, about GDPR, I had a *huge* clean up of my subscriber list. If you didn't confirm the new GDPR consent then you'll need to resubscribe. No worries, as you can sign up again and we'd be happy to welcome you back. If you've never signed up then you might be interested in the perks of being a member, such as access to this pattern a month before anyone else! The next newsletter is due to go out after I get back from Woollinn at the end of May. The sample is worked in Noro and will work comfortably an an aran weight yarn of similar gauge. The pattern will be exclusive to members of The Woolly Hat Society until the end of June. Techniques wise, it's a little more challenging that many of my Free Patterns - there are short rows on the brim to help shape that bonnet style fit. After that, its garter stitch in the round with a soft gathered finish.